“I think people marry far too much; it is such a lottery after all, and to a poor woman a very doubtful happiness.” So wrote Queen Victoria, and reading Kate Summerscale’s extraordinary dissection of a failed marriage, it is hard to argue. In 1850, Isabella Robinson, a bored and restless married woman of 37, met 27-year-old Edward Lane at the Edinburgh home of his mother-in-law. While Isabella’s businessman husband Henry was absent, Lane saw a friendship between his wife and Isabella develop. Isabella, however, read his polite attentions as suppressed passion, which she brooded over in her diary. 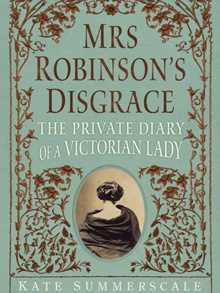 When Robinson’s work took his family south, Isabella developed crushes on other young men, but her marriage jogged on. Then Lane qualified as a doctor and set up a practice near Farnham, where he offered the fashionable “water-cure”. Isabella became a patient, even while recognising that all he had to offer her was “cool friendship”. Then at some point Lane made overtures, although whether the pair crossed the line to outright adultery will never be known. At the same time, Henry discovered that Isabella had been giving money to the recipients of her crushes and the family decamped to Boulogne. Soon after, Isabella developed diphtheria and rambled in periods of delirium. What she said is unknown, but it led Henry to her journal, and as soon as she recovered he collected their children, her papers and left. At this date marriages could be dissolved only by an act of parliament, unaffordable for all but a tiny minority. But two years later, in 1858, everything changed: a new act made divorce a possibility if adultery were proved against the woman, and Henry’s was the 11th petition lodged under the new law. Isabella’s defence was that, since keeping a diary of such explicitness was madness, then she must have been insane: the diary merely recorded what her counsel claimed were lunatic fancies. Lane, with his reputation on the line, agreed. Isabella, he swore, had merely been a friend of his wife and, later, a patient. Summerscale is fascinatingly forensic, parsing the various witnesses’ statements as she did in her earlier The Suspicions of Mr Whicher, turning the did-they-didn’t-they question into the best kind of detective story. She astutely notices Isabella’s resemblance to Madame Bovary, Flaubert’s notorious novel of the previous year, which has come to embody the fate of the unfulfilled woman longing for life to be an unending romantic novel. There are perhaps too few reminders that we are, ultimately, hearing Isabella’s story, based on her journal, with nothing equivalent to give Henry’s view of events. Summerscale’s description of Henry as “uneducated, narrow-minded, harsh-tempered, selfish, proud”, is, in reality, not hers but Isabella’s. Even the fact that Henry had a mistress and illegitimate children appears to derive from Isabella alone, for they were never mentioned in court. Perhaps they never existed? And while Isabella claimed that Henry was rapacious, a more interesting story may be lurking under the surface. Isabella had about £400 a year, while initially Henry earned significantly more, making them rich. Their move to Edinburgh, however, suggests an attempt to reduce expenditure, especially when coupled with the fact that they employed only four servants. Their subsequent relocation to Boulogne would then indicate an even more extreme financial retrenchment: the French town was a resort for the genteelly down-on-their-luck. Summerscale is too original a writer to quote Tolstoy’s “Happy families are all alike; every unhappy family is unhappy in its own way”, but she follows his lead, detailing the specific unhappinesses, and mapping the way these miseries spread and infected everyone they touched. That she manages to make the end surprising shows her literary dexterity. Had I been a judge at the Robinson trial, I would have found Isabella guilty for offences against literature: “I dipped my pen but too often in the fairy ink of poesy”, she wrote to herself. Summerscale triumphantly avoids fairy ink and poesy both, producing a gripping account of the destruction of a marriage. This entry was posted in Journalism and tagged 19th century, Journalism, Mrs Robinson's Disgrace, reviews, Summerscake, Telegraph, Victorian by inspectorbucket. Bookmark the permalink.